X1 Tilt Top Base 200 and stylish French Touch HPL square tabletops are built for indoor and outdoor dining spaces. The versatile, compact 22" x 28" table base features patented smooth folding technology, allowing the top to easily adjust and legs to nest together for convenient storage. Utilizing powder-coated reinforced aluminum, X1 Base 200's are constructed to endure high volume use and offer resistance against damaging factors such as scratch, burn, stain or high heat. 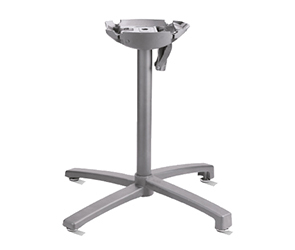 X1 Tilt Top Base 200 with optional 36" HPL tabletops combine aesthetics and superior service, all while requiring minimal maintenance to complement a variety of facility requirements.